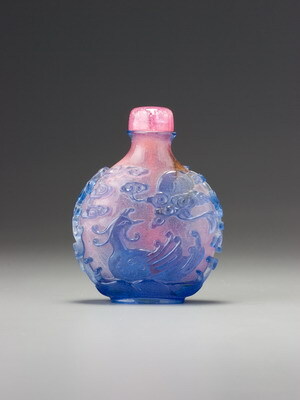 This bottle seems likely to date to the mid-Qianlong era, if the carving style of the bamboos is reliable evidence. The depth and three-dimensional quality of the carving, combined with the very thoughtful composition, are typical of the Qianlong era, but less likely for the Daoguang reign, to which it was previously ascribed. The ground is the typical snowstorm so often used during the eighteenth and early nineteenth centuries, and referred to in Chinese sources as ‘lotus root powder’ (oufen). There is no published material from the archives relating to this ground, unless it is the subject of the 1747 reference to ‘speckled opaque white’. 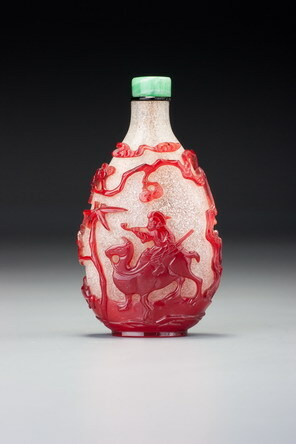 The magnificent dragon and fenghuang bottle in the J & J Collection (Moss, Graham, and Tsang 1993, no. 360) is one of the obviously early examples with a snowstorm ground, albeit a discreet one. In the light of our current research into glass we would now date it later than we did, perhaps as late as the early Qianlong era. We do not believe anything with this ground can now be dated with confidence to much earlier than the Qianlong reign.